The IFD1024 Featherweight Daylight LED Light is designed and built for photographers, videographers and cinematographers who want professional quality at an affordable price. 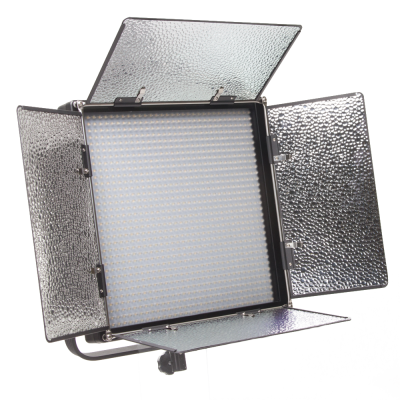 The Daylight 14” x 14” LED light delivers field-tested reliability, solid construction, and all the features required for professional performance. The IFD1024’s features include energy efficient LEDs, a wide 60-degree angle and a lightweight design that delivers reliable, consistent performance. The IFD1024 Featherweight Daylight LED Light features 1024 energy efficient LED lights that are dimmable using the LCD touchscreen. A large rotary knob and an included remote are also used for dimming. The compact design with integrated yoke mount makes the IFD1024 portable and easy to set up. A multi-voltage DC power supply is included and for portable power a pro battery plate for both Sony V-mount and Anton Bauer is supplied. A removable diffuser is included and the pre-mounted four leaf barn doors with intensifiers can be folded flat for transportation. 17 × 14 × 3.75"
14» × 14« × 2 3/4"